Last year there was a lot of excitement when it was announced that Curious George will be celebrating Ramadan. A popular series of children’s books, Curious George is about a monkey called George and his adventures. So for such a popular series to incorporate Islam and Ramadan into one of his stories is just brilliant as it will reach such a wider audience (in sha Allah). We couldn’t wait and pre ordered the book as soon as we heard about it! 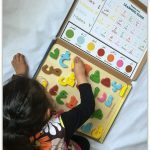 As the book is a sturdy board book, it is suitable for even the younger children. 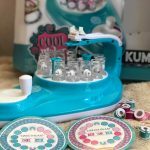 The book itself is a perfect introduction to ramadan for young muslim children or indeed parents and children who are interested in ramadan and want to learn more. 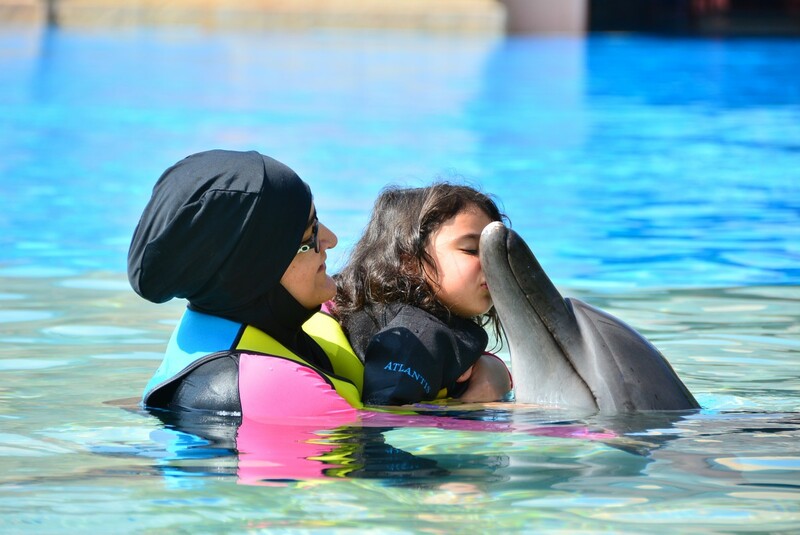 In the story they are introduced to the concept of fasting and eating at sunrise and sunset, giving charity and helping others, looking for the moon at the end of the month and finally celebrating Eid. One of the things I loved about the book was the tabs on the right, helping anyone reading it find a particular section about Ramadan if they wanted to discuss a certain aspect of ramadan. Everything is described in simple terms, so if you are looking for a detailed explanation then this isn’t the book for you. However it is perfect for the younger children who would get overwhelmed with too many facts. I have been reading the story to Bee, who is 4, and she seems to be enjoying it and learning about ramadan. 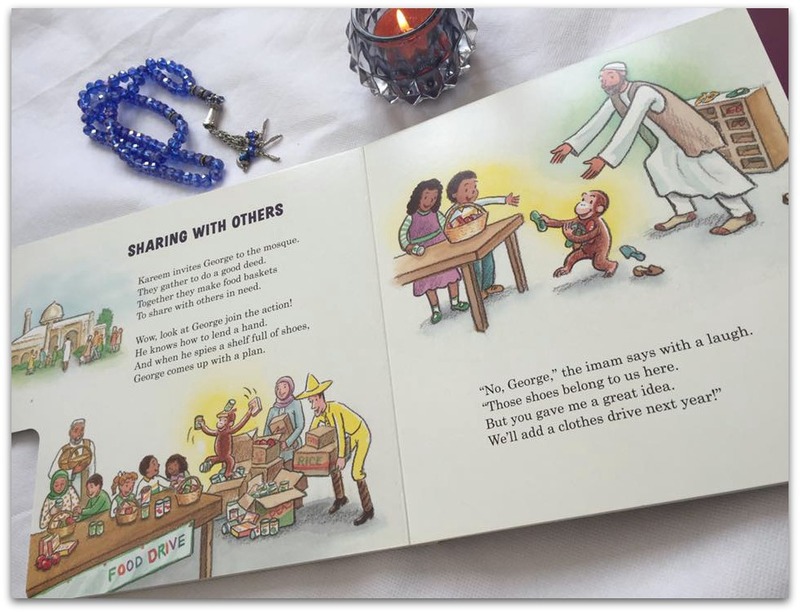 One of the things I noticed was how the author and the illustrator have clearly tried to show the diversity of muslims. Every country and culture have their own special dishes at ramadan, but a variety were mentioned, including pizza! In addition to this the pictures show Muslims in a variety of clothes, both eastern and western. The pictures themselves are simple and colourful and really add character to the story. A lovely little book, introducing ramadan through a popular character. One we would recommend. 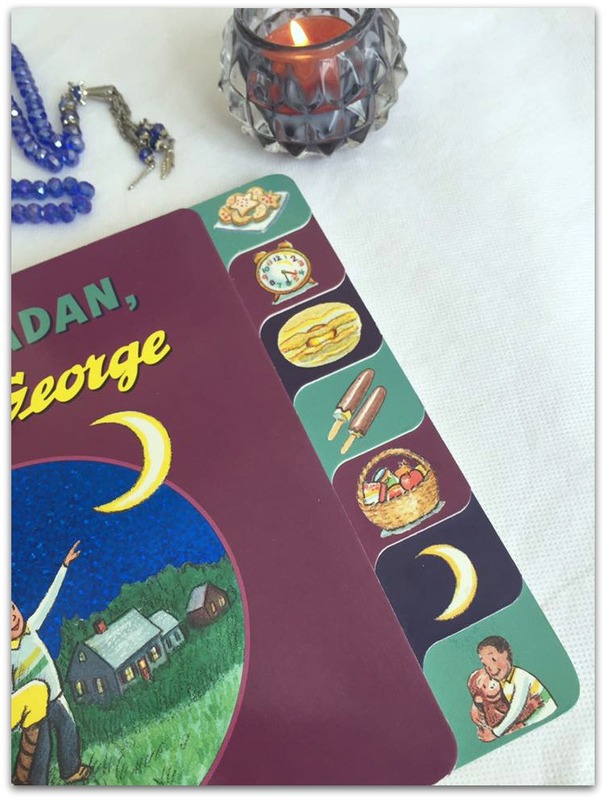 This book sounds fabulous…My lil one is fond of board books….good way to make kids learn and read more about Ramadan…. Ahh I have come across this book on Instagram quiet a bit recently! My younger brother loved watching Curious George! Sounds like a great read! It is a great book, my boys loved reading it 🙂 Thank you for sharing your views on the book. We LOVE this! I especially like how the man in the yellow hat is called Kareem! Lol! This is a firm favourite in our home. We bought this book last year and its been a family favorite since. Ramadan or not this book is a must have for every Muslim home ! 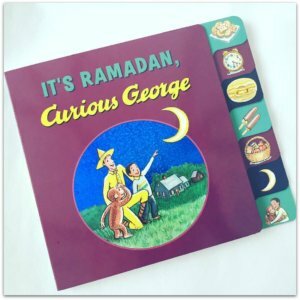 I love the idea of Curious George celebrating Ramadan!! How wonderful! Thank you for sharing it! Wow…I didnt know it before. George and Ramadan? What a surprise! I love to hear this. Should get one if possible insha Allah.